Posted byBramus! 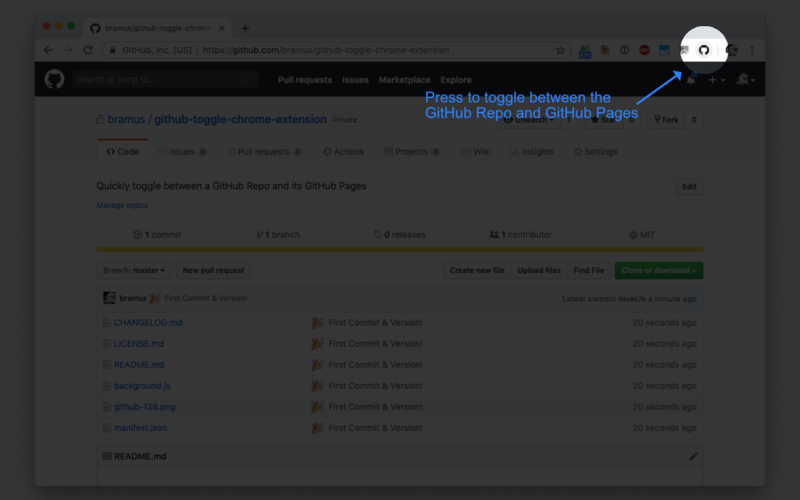 March 25, 2019 Leave a comment on GitHub Toggle Chrome Extension – Quickly toggle between a GitHub Repo and its GitHub Pages by the click of a button. Last week Christian Heilmann (codepo8) released a handy bookmarklet that lets on switch between the GitHub Pages URL of a repo hosted on GitHub and the repo contents itself. This afternoon I took the liberty of transforming it into a Chrome Extension, mainly as an exercise to myself. The extension adds a small button which becomes active whenever you are visiting a *.github.com or *.github.io domain. Upon clicking the button you toggle between the two URLs. How to Make a Chrome Extension is a good starting point, but you’ll quickly want to check out the official documentation too. Chrome provides a nice API which you can find at its Developer Guide. But before checking those, it might be worth to take a peek at some of the examples. I especially found the cld, pageaction_by_url, and merge_windows examples interesting. To publish your extension head over to the (new) Chrome Web Store Developer Dashboard. No need to pack it locally into a .crx file: you only have to create a .zip file and upload that zip.